Julianna Barwick starts to describe her experience in the male-dominated field of electronic music, but one sentence in, she interrupts herself to consider the ambiance on my end of our phone call. I live on the first floor of my building and there’s work being done on the street just outside and it’s producing a half-pleasant, half-maddening sustained tone that I’ve spent the past minute or so hoping isn’t as distracting to her as it is to me. It turns out that it is. “I wonder what note that is, that hum,” she says brightly, before diving back in. I take the respite more as a sign of a perpetually musical mind than a ready distractedness at my question about her womanhood, but there’s probably some of that in there too. 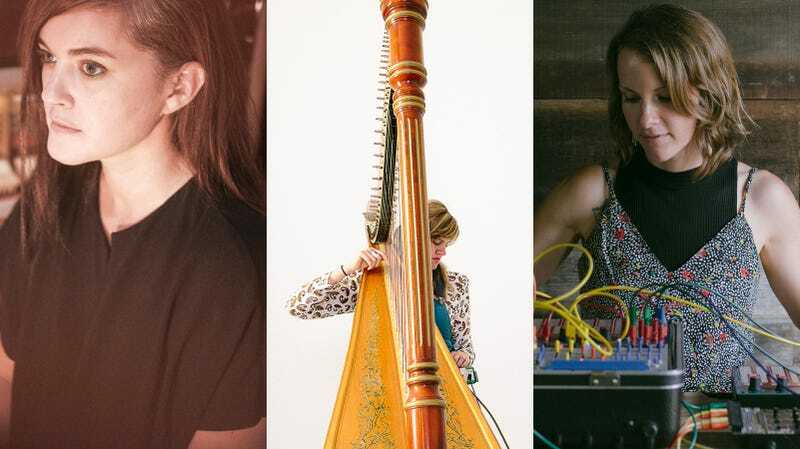 Barwick and the two other women I spoke to by phone for this piece—Mary Lattimore and Kaitlyn Aurelia Smith—defy and rebuke easy categorization, but nonetheless there is a basic sort of logic to them sharing the bill for Sunday’s Red Bull Music Academy 10-hour chillfest Beyond The Clouds: Ambient Excursions in Brooklyn. It’s reasonable to place them all in the broad category of ambient music, which in contemporary casual usage could be used to describe any music that is beat-less and electronic-leaning (if not wholly synthesized). But this umbrella is broad enough for them (as well as the other nine musicians to be on the bill) to be utterly distinct from each other. In fact, the entire point of these musicians seems to be to achieve an aesthetic that is as distinct as possible. In thinking about my excitement for Beyond the Clouds (which will be presented complete with special furniture and a sound system to maximize the chill vibes), it strikes me how little we talk about women when we talk about electronic music, particularly that which is deemed “ambient.” The same could be said about virtually all genres outside of pop, R&B, and country, but at least with something like hip-hop, the dearth of space afforded to female voices is a noted phenomenon. Rarely is it mentioned just how unmentioned women electronic musicians go. Pitchfork’s recent 50 Best Ambient Albums of All Time list included about a dozen female musicians in the 60 or so represented on the list—and that’s a bigger ratio than most retroactive discussions on this music tend to reach. The RBMA night manages an even better ratio, albeit still male-heavy: Of the 12 musicians on the bill, four of them are women (including the three mentioned in this piece and Dorit Chrysler, a producer/theremin-player/singer). One third, at least, is a bigger fraction than usual. What’s particularly galling about this lack of representation is that women have traditionally been at forefront of electronic music. Smith describes studying pioneers in music school like Delia Derbyshire (who helped compose and electronic-ify the Dr. Who theme in 1963), Pauline Oliveros (a theorist and founding member of the San Francisco Tape Music Center alongside her more celebrated peers Terry Riley and Steve Reich), Daphne Oram (a musique concrete pioneer whose ‘40s composition Still Point was the first meeting of acoustic instruments and electronic manipulation), and Suzanne Ciani (an electronic sound effects mastermind and fellow Buchla-player with whom Smith collaborated on last year’s gauzily gorgeous FRKWYS Vol. 13 Sunergy). And then there’s Else Marie Pade, the first Danish composer of electronic and concrete music. And then there’s Laurie Spiegel, a programmer/composer whose opus The Expanding Universe has lost nothing in the 44 years since its earliest composition was recorded. And on and on and on. That’s to say that the reason to talk about women in electronic music is simply because not enough people do. And here we are. The things that attracted me to electronic music originally were being able to have a rhythm that was very slow and not pounding. There’s usually a traditional rhythm, like a dance rhythm or a rock rhythm, that will hit you over the head. Humans naturally don’t play really slow rhythms easily. With the machine, you have perfect dependability and very slow tempos. To me, that becomes sensual; it becomes slow and I think it’s a dimension that traditionally men don’t explore. I think that’s more of a feminine force than the pounding rhythms that people frequently do with the machines. Indeed, that is the freedom of making art that is abstract. “I think it’s just trying to convey human emotions and feeling like a human being, that’s where it’s coming from,” said Lattimore, who compared her music to “an E.T. finger glowing to another human being.” All of Lattimore’s music is personal, albeit through an impressionistic filter. So a song like “Wawa By the Ocean,” off her latest, Collected Pieces, was written with an actual convenience store on Long Beach Island in New Jersey in mind. The harp is generally regarded as a feminine instrument, at least in America (Lattimore points out the abundance of male harpists in Europe), though if there’s a cross to bear it has more to do with antiquated musical associations with the harp. So distinct and clear in their vision are the women interviewed for this piece that I wondered if they even considered themselves creators of ambient music, at all, given that it’s such a nebulous concept. Brian Eno, the godfather of ambient, famously said of it: “Ambient music must be able to accommodate many levels of listening attention without enforcing one in particular; it must be as ignorable as it is interesting.” It is obvious that Barwick, Lattimore, and Smith could very well have conjured the music that they do without ever considering how it may fit into the bigger picture of categories and Red Bull. Still, Eno’s credo, which emphasizes utilitarian outcome over sonic intent, does seem to apply to the music of Barwick, Lattimore, and Smith. I’ve come to bond quite closely with these women’s output because I have meditated to it. I’ve found that music I meditate to, I tend to form a strong relationship with because I’m basically alone with it during that time—these bonds remind me of that which I made with music in high school. Barwick’s, Lattimore’s, and Smith’s music is all good for scoring meditation, depending on how you want to set your mind—Barwick’s music has the kind of amorphous heft to it that’s perfect for hanging your brain on, while Lattimore’s is a bit busier though similarly mesmerizing, and Smith’s is so active that when I meditated to Ears earlier this week it practically induced a fireworks display behind my eyes. Ultimately, what it seems that these artists have most in common is the liberation to create a sound that is patient and singular to the point of being free of genre and gender trappings. And they all seem to relish their individuality. “I talked to a label head before I was signed to anybody, years ago, and he was like, ‘Do you ever wear crazy stuff on stage, like gold stuff or anything?,’” says Barwick. “I was just thinking, like, ‘I’m never going to listen to anyone making suggestions to the stuff I make.’ It just feels so weird to have someone tell you to do something different than what you’re doing. You connect to it, and the people who like your music connect to it, and also I just don’t like being told what to do.